Select the template of your choice. Is defined in the portal properties and can be edited there. Allows you to output the document in .ODT. Generates a .PDF file based on the template. 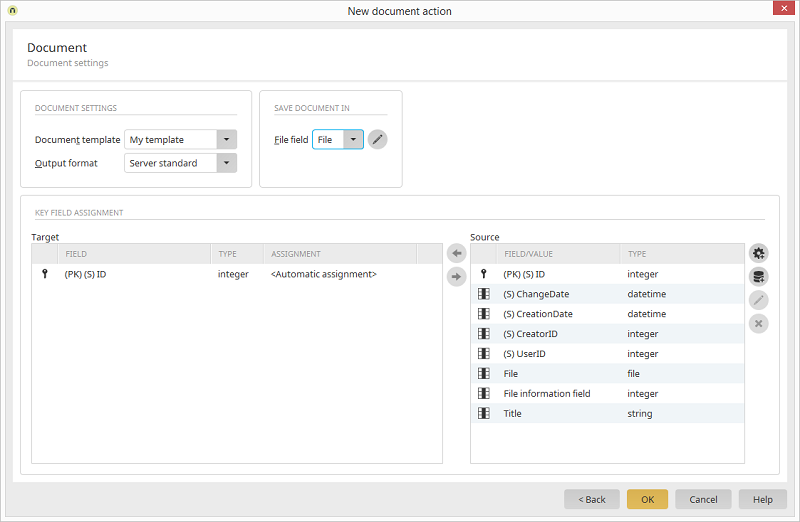 Allows you to define the file field that the document is saved to. The currently selected file field is shown here. Opens a dialog where the settings for saving files can be edited. If the "Add record" action has been selected on the General tab, the Key field assignment area will be shown here. The primary key data field of the target data group is shown here. <Automatic assignment> means that Intrexx has determined the primary key of the target data group and will create new IDs where documents are added.